The filmmaking industry has been experiencing difficulties trying to achieve optimal brightness and dynamic range due to the lack of top quality monitors. With the Atomos Ninja Flame, the issue looks solved as this AtomHDR 1500nit Field Monitor with a capability of recording a 4K/HD 10-bit ProRes/DNx over HDMI offers precisely what film and photograph shooters require. The monitor incorporates all brightness ranges and offers natural and vibrant colors giving the recording experience a touch of nature. With the Shogun Flame the Ninja Flame, Atomos has effectively redefined the boundaries of on-set monitoring and recording. The new generation of monitor recorders from Atomos comes with significant technological advancement over their existing line equipped as they are with AtomHDR engine and new 10 bit processing capabilities. Unlike the Atomos Shogun Flame which supports SDI, HDMI and raw format, the Atomos Ninja Flame supports only HDMI formats and is meant to be a more affordable alternative to the Shogun Flame. Typical of all Atomos products, the Ninja Flame also comes packaged as a complete kit with battery charger, 2x NPF style batteries, HPRC hard case, five HDD/SSD caddy cases, USB3 dock, control cable and d-tap cable as well as sunhood. Undoubtedly the biggest technology leap in this 7″, 1920 x 1200 on-camera recording monitor is in the display technology, the Atom HDR engine. Along with the 10 bit panel, the Atomos Ninja Flame has a brightness range of over 10 stops and allows you to monitor your log gamma footage in full detail in all its natural, vibrant colours. The new technology provides a highly effective solution to one of the biggest problems faced by videographers, watching perfectly well shot images turn into flat washed out images with important detailing cut off or lost in the play of shadows on the images while watching them on monitor through camera log. With the Atomos Ninja Flame the HDR log images display accurately with full brightness, it is like watching them with the naked eye. It is worthwhile to mention that the Ninja Flame supports logs from most major camera manufacturers including Canon, Sony, Panasonic, Nikon to name a few. 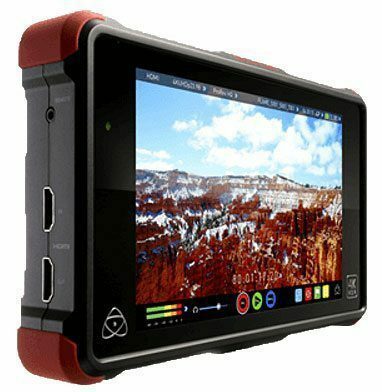 The technologically superior AtomHDR engine, there is lots more that makes the Atomos Ninja Flame stand a class apart from the rest. One of the key features in the Ninja Flame is a calibrated 7″ 1920×1200 325ppi 10 Bit panel with the capability of resolving more than a billion colors. The first of its kind daylight viewable field monitor, it also comes equipped with 1500nit panel technology that allows you change formats when required. So for instance in situations which do not require HDR log recording or 10 stops of dynamic range, images are typically compromised due to lack of brightness. But with the 1500nit panel, the brightness of the monitor remains intact so that even standard shots can be viewed in full brightness even in outdoor shooting environments.